This morning a mist rolled down from the Mourne Mountains to the sea and enveloped our town in swirls of myth. I was half expecting to see Queen Maeve and her warriors charge past the front door as we piled into the car to get to school. It was the kind of mist that deadens the sound of engines, it made me feel like we were the only 2 people in the world walking home today. Just the small boy and I, wrapped against the frost and fog, racing back to get a hot mug of tea. I still yearn for more adult company and time to myself. After a hard day yesterday, this morning’s stillness made me pause and catch my breath. I’m grateful for the chance to do that. Cake doesn’t make things better but it does sometimes smooth over the crumples of the day. Where voices raised in haste can bring tears, stubborn thin lips soften with the promise of a comforting drink and a little bit of sweetness. I’m sure when my children get older they’ll be convinced that I was baking all the time in their childhood! In truth I don’t bake cakes and treats everyday, this was something special. Preheat a (fan) oven to 180 degrees Celsius. 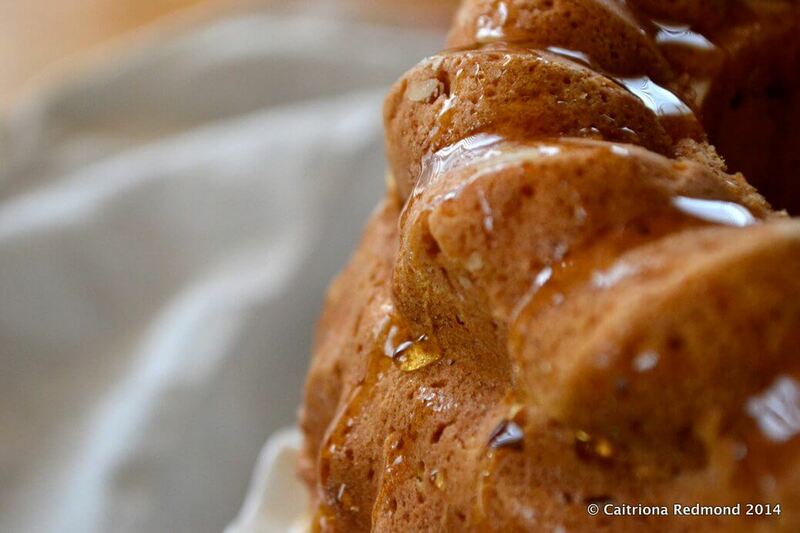 Grease and dust your bundt tin with flour. If not using a bundt tin this will work fine in 2 x 17cm diameter sandwich tins. Cream the honey and butter together. Beat in the eggs (it will go into a loose batter and may take on a scrambled consistency. Don’t worry, just add a tablespoon of the flour nad then beat again and it should stabilise. Add the rest of the flour with the baking powder and ground ginger and stir well once you’ve combined the eggs and butter mixture. Peel and grate the apples directly into the cake batter. Stir well until completely coated with the cake batter. Spoon the mixture into the prepared cake tin. 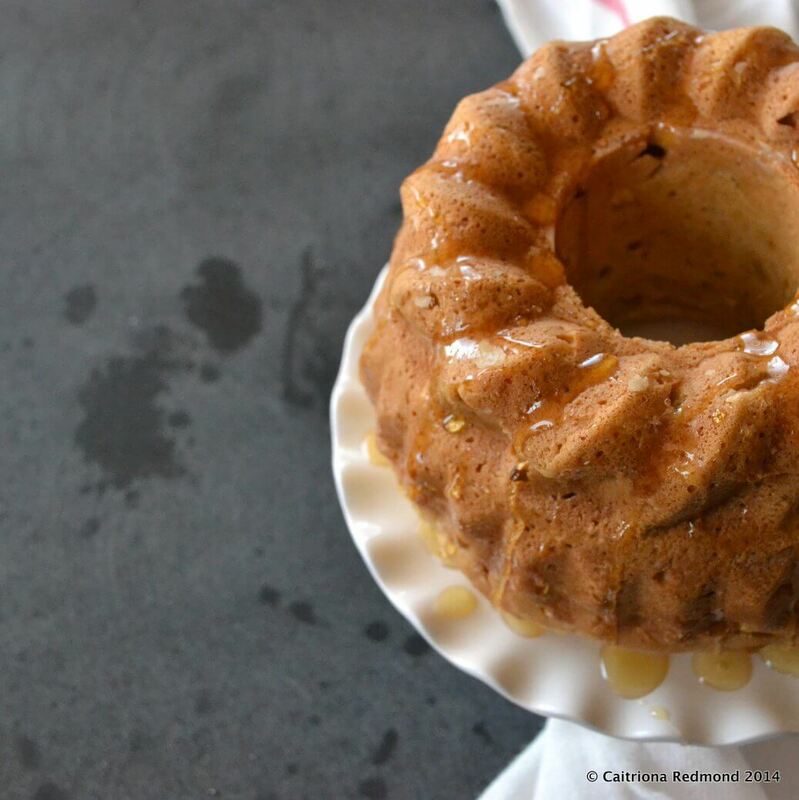 Bake in your preheated oven for approximately 45 minutes using a bundt tin. After 45 minutes, test the centre of the cake with a skewer; if it comes away clean then the cake is cooked. If not, then return to the oven for a further 10 minutes before testing again. Allow the cake to cool in the tin until the cake comes away from the sides. This takes about 20 minutes or so. Tip out the cake and allow to cool on a rack. Serve with a little bit of warm honey drizzled on top. So easy and yet so elegant. The fog always makes me forget the outside world, like a cocoon wrapped in silence. Happy Thanksgiving from Florida. Thank you for your lovely, lovely posting! It is Thanksgiving, today, here in the US – following days of unwelcome too-early snow. Your wonderful recipe is one I cannot wait to try a day or two after this busy day … while enjoying the quiet, with thankfulness. This looks so good. Honey and ginger are so good together. I keep meaning to buy a bundt tin so I definitely need to get on the case now!